OHL Draft Rankings - Top 80 Prospects #OHLDraft - Very Barrie Colts | A website covering the Barrie Colts of the OHL. First off, congratulations to all the prospects who represented Team Ontario at the 2019 Canada Winter Games. Congrats on the silver medal boys! Here is a photo of the squad. Shane Wright is a 2004 born player dominating the 2003 born circuit. 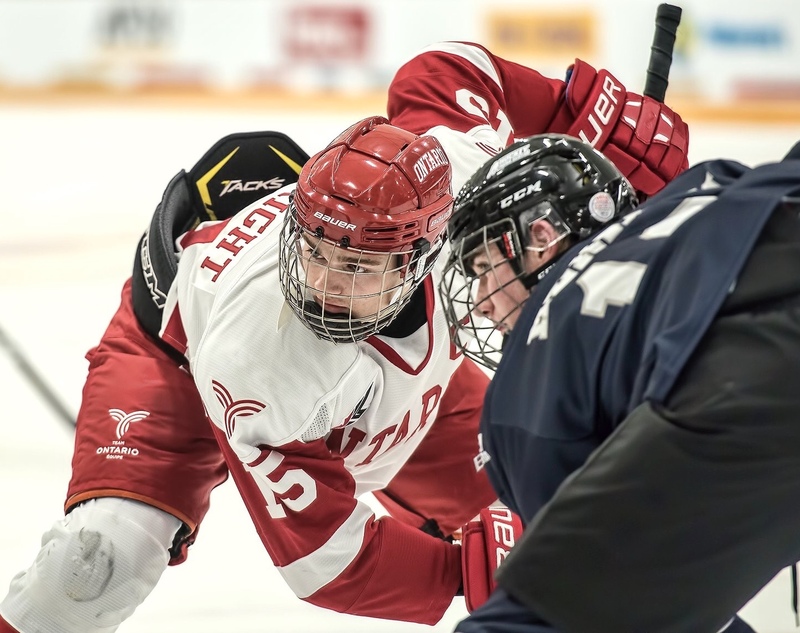 Exceptional status must be on lock down for Wright, because another year of minor midget AAA would make no sense (UPDATE: Wright was granted exception status on March 8, 2019). He is the real deal and whatever team is lucky enough to draft him will likely get three years of his services (expect him to go to the NHL after his draft year). All the physical tools are there and his hockey IQ is next level. The way he sees the ice, distributes the puck, and attacks open gaps is impeccable. Watch out for the quick wrister mid-level and under the glove. That’s his go to move, but Wright has several tricks up his sleeve. I’ve seen him put the puck in the net almost any way imaginable. Shane had recorded over 100 points by December 23, 2018 according to the Don Mills Flyers. He led the Don Mills Flyers to an OHF Bantam Championship last season with 15 points in 8 games. His Don Mills Flyers have only lost one game this season (finals of Silver Stick to Compuware), and they won the Toronto Titans Prospect Tournament and Wendy Dufton Memorial Tournament in dominant fashion. The Don Mills Flyers were tested at the Toronto Marlboros Holiday Classic, but emerged victorious. Shane Wright got the OT game-winning goal in the finals and was named MVP of the tournament. Exceptional Player Status 👍@OHFHockey announces @HockeyCanada’s decision to grant Shane Wright eligibility for the 2019 #OHLDraft. Brandt Clarke is going to make an OHL fan base very, very happy. The offensively gifted defenceman is oozing with skill and is very creative in the offensive zone. He can make all the fancy plays and it’s easy to see the similarities between him and his brother Graeme (forward for the Ottawa 67s). His stick handling and deceptive dekes are unmatched in this draft class. Clarke has incredible puck skills – he can make it disappear like he’s doing a magic trick when the opponent tries to take it off him. Clarke shows off his ability to dangle with a successful "Michigan Move" executed in one of the clips below. According to the Don Mils Flyers, Clarke hit 100 points on January 24, 2019. That's absurd production for a defenceman. McTavish plays the game with an exceptional combination of skill and power. It's extremely difficult for opponents to knock him off the puck or break his stride. The strength he possesses is mind-boggling for this age group. Mason can also make really nice moves with very little space or room to maneuver. He is like a freight train coming through and he unleashes a very heavy shot off the rush off a quick release. I was behind the glass when he missed a shot attempt and it hit the glass a few feet over. My ears were ringing for a few seconds after - that shot tracks at high velocity. Great point production in the HEO Midget AAA league and seven points in five games at the junior level is impressive. Had to move him up to the three spot. Sasha Pastujov had himself a tournament at the Silver Stick in Whitby. Him and Dylan Duke (see #11 on this list) had an incredible weekend and wowed those in attendance. The finals with the Don Mills Flyers (5-4 OT win) was an absolute classic. Pastujov displayed a nice wrist shot that found the net frequently. He can change up his speed drastically to keep defenses on their heels and stop on a dime. This kid can really play and his puck skills are special. Check out a goal by Pastujov (wearing #12) from the Silver Stick Tournament (assisted by #25 Dylan Duke) below. Othmann is Shane Wright’s partner in crime. He is the perfect complement to Wright and they play extremely well together. Othmann is super sturdy and can bury the puck. His finishing touch is really high-end. Deceptive head fakes and quick hands are part of the equation. Othmann fools goalies and defenders to keep them off balance and on their heels. Brennan had scored over 50 goals and 100 points this season by December 23, 2018, according to the Don Mills Flyers. Schmidt is absolutely massive. The tale of the tape has to be in the 6-5 or 6-6 range and well over 200 pounds. For such a big guy, he is quite nimble on his skates and has pretty quiet feet. Overall power and strength are his main strengths. His shot is an absolute cannon and he makes the puck very heavy. I’m surprised when his shot hits the glass or the boards that it doesn’t go right through. Lockhart is a highly skilled center from the Ottawa area. This kid has uber quick feet and a crazy good first step. He is the full offensive package with excellent moves, natural scoring talent, and excellent playmaking ability. Connor has a deadly accurate shot and scores really eye popping goals. His movement without the puck is impressive and he displays high hockey IQ in this area. Offensively, Connor darts through open gaps and creates lanes for his teammates. On the defensive end and in the neutral zone he is excellent at cutting off passes and disrupting plays. The natural ability is there, but he also has the hockey intelligence to be a major superstar in the OHL. Shut down D. The stats aren’t overly impressive, but they are decent. Del Mastro jumps up into the play very well and displayed this at the GTHL Top Prospects Game with a goal. He plays a complete game and I’ve been very impressed by his style for a while now. Ethan uses his big frame and skating ability to gain leverage on opponents, and it's very hard to beat him off the rush. He is very tough below the dots and he wins most puck battles down low. He played up with the minor midget Marlies last season when they were short a defenceman. AYHL 16U - 26G & 32A for 58 points in 21 games. TIEHL U16 - 19G & 33A for 52 points in 21 games. I haven't seen Wilmer since Bantam when he played for the Long Island Gulls. Wilmer is an offensive catalyst and is racking up points this year. Even though I haven't seen him this season, I must rank him in the top 10. He looked too good when I saw him last season and his statistics are absolutely outrageous. Zhilkin was my favourite player in the bantam age group when he played with the Toronto Nationals. He made the move to the Marlies for his OHL Draft year and looks fantastic in the blue and white. He is really, really fast and tracks well at his top speed. It's hard to rank a player with blazing speed and control any lower than this. If he sticks to his commitment to Boston University, it will be a hugh loss for OHL fans. Lots of talent here and he's the best forward on the Marlies, who always have a juggernaut minor midget squad. Duke can really motor and has excellent overall skating skills. He is undersized, but he has the speed and skill to be a big time star in the OHL. Duke and Sasha Pastujov (see #4 on this list) worked really well together at the Silver Stick. Duke is a fantastic playmaker, but he can also finish off plays as he regularly displays a nice scoring touch. Harrison is a pure game breaker in every sense of the word. He drives the London Jr Knights and has a really powerful motor. Easily a first rounder and probably should be ranked higher, but I'm not sure who to drop. Sirizzotti can flat out score. The numbers he is putting up this season are absolutely insane. He is also a very strong play maker and makes really exceptional plays with the puck. He could be the best pure offensive player in the draft. His offensive instincts are incredible and he has a knack for it. These skills come naturally and OHL teams will be very intrigued about his offensive fire power. CCHL - no points in 3 games. Incredible combination of size, skill, and power. Scored a nasty curl n' drag snipe at the Marlies Tournament and was all over the score sheet during the event. There's loads of gas in the tank with Rolofs and he has shown incredible stamina. When you think he is at the end of a shift, he finds a second wind for another high octane burst of speed and power. Do you want the puck? Well, Liam Arnsby will go get it for you. I’ve seen Don Mills play a ton of games and I’m not sure I’ve ever seen him lose a 50/50 puck battle. He also throws vicious hits and has absolutely leveled and intimidated his opponents regularly. Not a fun guy to play against. He is very, very strong on the puck and leans real hard on his stick. There is a ton of offensive talent, but he plays in both zones really well. He can really score and generate offence. These types of pivots are special, and he is about as complete as they come in this draft. Speed kills and Pinelli has it in spades. His hands keep up with his feet and he has made some moves that make my head spin. Pinelli plays with a bit of mean streak and likes to stir things up a bit. He is very physical and doesn't shy away from contact in the tough spots. He will be a superstar in the OHL. Take a look at a fine example of his handy work below. Alliance (Midget) - 1A in 2 games. Right shot D with great play making skills. Hipkin will go high in this draft since he plays the very important right defenseman position and does it very, very well. The distribution skills with the puck are very strong. Cole uses the boards really well and is very creative with where he puts it. If there is no play there, he wires the day-old biscuit high and hard off the glass to relieve pressure. Hipkin is the rock on the back end that every OHL team needs. Remember those hockey players in high school who used to get followed around by the football coach (who incessantly tried to get them to join the football team). Well, that’s Artem Guryev to a tee. This kid is a flat out missile who throws extremely booming body checks. However, the best thing about his game is his positioning. He is always in the right spot and covers well. There’s a really nice wrister/snap shot there too. Del Monte could have the best hands in the entire draft class. His moves are flat out stunning and he can deke the jock strap off many OHL defenseman right now. The question is how firm his commitment is to Harvard University. It would be a huge loss for OHL fans not to watch this kid develop. Hopefully an OHL team can recruit him to join the league. Alliance (Midget) - 1G in 1 game. GOJHL (Stratford Warriors) - no points in 3 games. Toronto Titans Prospect Tournament - 2G & 2A for 4 points in 6 games. GOJHL (Chatham Maroons) - 1G in 1 game. OMHA - 38G & 34A for 72 points in 36 games. AYHL 16U - 10G & 10A for 20 points in 21 games. T1EHL U16 - 3G & 8A for 11 points in 20 games. Midget - 10G & 29A for 39 points in 37 games. HEO - 3G & 14A for 17 points in 31 games. CCHL - no points in 2 games. HEO - 6G & 23A for 29 points in 37 games. CCHL - no points in 4 games. Alliance - 21G & 41A for 62 points in 33 games. Very Barrie Colts podcasts hosted by Ryan McArthur and Ryan Noble.